Attitudes toward exercise during pregnancy have changed dramatically over the past 20 years. Recent studies show that, in most cases, exercise is safe for both the mother and fetus during pregnancy and support the recommendation to initiate of continue exercise in most pregnancies. , All active pregnant women should be examined periodically to assess the effects of their exercise programs on the developing fetus and hence that adjustments can be made if necessary. Women with medical or obstetric complications should be carefully evaluated before recommendations on physical activity participation during pregnancy are made. Despite the fact that pregnancy is associated with profound anatomical and physiological changes, exercise has minimal risks and confirmed benefits for most women. Previous studies have found that being sedentary before the onset of pregnancy is a risk factor, not to start exercising when pregnant,  confirming that women who are accustomed to exercising prior to pregnancy are more likely to maintain this habit and that those not physically active prepregnancy do not start during pregnancy. Hence, to achieve higher rates of exercise during pregnancy, health promotion programs should target the general female population in their childbearing years. The American Congress of Obstetricians and Gynaecologists, recommended that pregnant women can exercise moderately for 30 min on most days of the week. The recommendations also promote exercise for sedentary women and those with medical or obstetric complications, but only after medical evaluation and clearance. However, studies have shown that most pregnant women do not exercise on a regular basis,  and that only 5-20% follow current exercise guidelines. Some authors have investigated the beliefs and attitudes of women with respect to the practice of physical activity in pregnancy and the factors that affect their behavior in relation to exercise. , This study was carried out to assess the knowledge and attitude about exercise during pregnancy among antenatal mothers. The study was conducted in the Department of obstetrics and gynecology, in Indira Gandhi Medical College and Research Institute, in Puducherry, in India. Indira Gandhi Medical College and Research Institute is a tertiary care hospital and medical college catering health needs to the people of the union territory, Puducherry and also to a huge percentage of people from various districts of the neighboring state, Tamil Nadu. The study population in our setting hence serves as a representative population of the South Indian women. All antenatal mothers attending our OPD for antenatal care and those who volunteered for the study were enrolled in the study. It was a cross-sectional descriptive study to analyze the knowledge, attitude and practice of exercise during pregnancy among antenatal mothers. Participation to the study was on a voluntary basis. All participants were assured of anonymity and confidentiality of responses. Data were collected using a self-administered pretested close-ended questionnaire. The questionnaire comprised of 25 questions (21 on knowledge, 3 on attitude and 1 on practice). For knowledge items categorical responses (yes, I don't know, and no) were applied with an item score of '2', '1', '0' respectively for positive knowledge. For attitude and practice, the answers were either yes, no. Data were analyzed using Statistical Package for Social Sciences (SPSS) version 20 (Armonk, NY: IBM Company) and results were entered as mean and percentages. The study involved a cohort of 200 antenatal mothers, and all completed the questionnaire. The response rate was 100%. The age range of the study group was 18-35 years with a mean age of 25 ± 4.51 years. The majority of the study population were Hindus (81%), had undergone primary education (63%) and were homemakers (74%). The sociodemographic characteristics of respondents are depicted in [Table 1].The total mean knowledge score was 20.53 ± 2.08. The level of knowledge of antenatal exercises among the study population is presented in Tables 2 and 3. Considering the overall response of the antenatal mothers on antenatal exercises, their knowledge was less than average based on the mean knowledge score. 66% answered that they have heard about antenatal exercises. 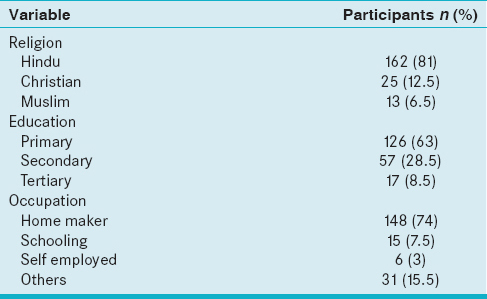 About 21% and 13% answered that they did not know or have not heard of antenatal exercises, respectively. Regarding the types of exercises awareness was better for variables such as breathing exercise, back exercise and abdominal exercise, viz., 54, 60 and 42% respectively. Awareness about other exercises like swimming, cycling and aerobics was poor. Values are shown in [Table 2]. When asked about the benefits of antenatal exercises the total mean knowledge score was 6.2 ± 2.1. The total mean knowledge score for contraindications was 8.6 ± 2.6. The details are shown in [Table 3]. 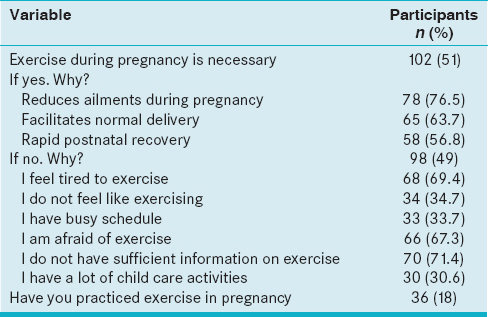 Issues relating to the attitude of respondents towards antenatal exercise are shown in [Table 4]. The results showed that 51% felt it was necessary to do exercise during pregnancy, and 35.2% among them have already done exercise in pregnancy. The main reason for doing exercise in pregnancy was the belief that exercise reduced ailments in pregnancy (76.5%), facilitates normal delivery (63.7%) and rapid postnatal recovery (56.8%). A major reason for those who felt that exercise in pregnancy was not necessary was feeling tired (69.4%), afraid of exercising (67.3%) and no sufficient information on antenatal exercise (71.4%). Details are shown in [Table 4]. The level of practice of exercise during pregnancy among our respondents was very less (18%). Our study was carried out to assess the level of knowledge, their attitude and practice of exercise during pregnancy among the antenatal mothers in our population. Our study population constituted respondents from a wide range of age group from 18 to 35 years giving a good representation of the population. The majority of them were Hindus (81%), as this forms the major population of the state. This is in contrast to the study done by Mbada et al. were 76% of the study population were Christians. 63% of our mothers have undergone only primary education, and 74% of them were homemakers. Only 8.5% have undergone tertiary education and only 18.5% are employed by some means. In a study by Ribeiro and Milanez  66.5% of the respondents were employed. Nearly 70% were employed and had undergone tertiary education in a study by Mbada et al. in Nigerian women. Our study estimated a total mean knowledge score of 20.53 ± 2.08 which was < 50%. Whereas the studies by Mbada et al. showed a mean knowledge score of 28.9 ± 4.6 and Ribeiro and Milanez  demonstrated that 67% of respondents had adequate knowledge. These contrasting results between our study and the previous studies show the positive influence of education and society on the awareness of pregnant mothers. When considering the knowledge on the type of exercise that can be done in pregnancy, the knowledge was better regarding, breathing, back care and abdominal exercise, 54, 60 and 42% respectively. The knowledge regarding exercises like aerobics, swimming and cycling was less, approximately 35%. In a study on Nigerian women,  they have reported knowledge over 50% in almost all variables. Few of our women who knew about the different type of exercises had information only on the usual types like, breathing abdominal and back care exercise. They did not know that exercises like swimming, cycling and aerobics even existed for antenatal mothers. This again shows the importance of education and social influence and also the lack of exposure to modernization and changes in the society. Similarly, a study done in Brazil  demonstrated good knowledge on exercise during pregnancy and correlated to better schooling among the respondents. Considering the knowledge of respondents on the effect of exercise on pregnancy, nearly 50% believed that exercise reduces the risk of back pain and weight gain in pregnancy, increases the energy and stamina, helps to cope up with labor and fastens postnatal recovery. Though 50% were aware of the benefits only 18% were actually practicing. In spite of the fact that, knowledge, attitude and practice of exercise during pregnancy among the study population was less when compared to previous studies, the reason for this outcome is easily identified as lack of awareness in the issue. Hence, health care programs should be organized to improve the awareness of antenatal mothers on exercise during pregnancy. Studies should be conducted to analyze whether the measures taken are having a positive impact on the women and increasing their motivation to practice exercising. Studies can also be done to evaluate the positive impact of exercise on pregnancy and on perinatal outcome. This will help to encourage even the group which is less motivated. The practice of simple and regular exercise in pregnancy will significantly improve physical wellbeing in pregnancy and good perinatal outcome. The cost is insignificant, but the benefits in terms of gestational wellbeing and health are considerable. These benefits can easily be gained through simple interventions at community level, providing social support and providing a healthy lifestyle. Identifying myths and misconceptions in the society would objectively encourage a change in attitude. This study discusses the rationale behind the different knowledge and attitude of respondents and suggests educational tools to initiate behavioral changes. We also propose better counseling and exercise prescriptions for the patients. The knowledge of our women on exercise during pregnancy was less than average, and their attitude was favorable. The main reason for poor knowledge was inadequate education. Very few were actually practicing exercise in pregnancy. The main attributable reason for the reduced practice was a lack of awareness on the merits and demerits of exercise in pregnancy. Avery ND, Stocking KD, Tranmer JE, Davies GA, Wolfe LA. Fetal responses to maternal strength conditioning exercises in late gestation. Can J Appl Physiol 1999;24:362-76. Hartmann S, Bung P. Physical exercise during pregnancy - physiological considerations and recommendations. J Perinat Med 1999;27:204-15.
do Nascimento SL, Godoy AC, Surita FG, Pinto e Silva JL. Recommendations for physical exercise practice during pregnancy: A critical review. Rev Bras Ginecol Obstet 2014;36:423-31. Awusi VO, Anyanwu EB, Okeleke V. Determinants of antenatal care services utilization. Benin J Postgrad Med 2009;11:21-6. Wolfe LA, Davies GA, School of Physical and Health Education, Department of Obstetrics and Gynaecology and Physiology, Queen′s University, Kingston, Ontario, Canada. Canadian guidelines for exercise in pregnancy. Clin Obstet Gynecol 2003;46:488-95. ACOG Committee Obstetric Practice. ACOG Committee opinion. Number 267, January 2002: Exercise during pregnancy and the postpartum period. Obstet Gynecol 2002;99:171-3. Haakstad LA, Voldner N, Bø K. Stages of change model for participation in physical activity during pregnancy. J Pregnancy 2013;2013:193170. Ribeiro CP, Milanez H. Knowledge, attitude and practice of women in Campinas, São Paulo, Brazil with respect to physical exercise in pregnancy: A descriptive study. Reprod Health 2011;8:31. Owe KM, Nystad W, Bø K. Correlates of regular exercise during pregnancy: The Norwegian Mother and Child Cohort Study. Scand J Med Sci Sports 2009;19:637-45. Krans EE, Gearhart JG, Dubbert PM, Klar PM, Miller AL, Replogle WH. Pregnant women′s beliefs and influences regarding exercise during pregnancy. J Miss State Med Assoc 2005;46:67-73. Cioffi J, Schmied V, Dahlen H, Mills A, Thornton C, Duff M, et al. Physical activity in pregnancy: Women′s perceptions, practices, and influencing factors. J Midwifery Womens Health 2010;55:455-61. Mbada CE, Adebayo OE, Adeyemi AB, Arije OO, Dada OO, Akinwande OA, et al. Knowledge and Attitude of Nigerian Pregnant Women towards Antenatal Exercise: A Cross-Sectional Survey. ISRN Obstet Gynecol 2014;2014:260539.